Enkei is a name that needs no introduction. Since its inception in 1950, it has been at the forefront of aluminum alloy wheel production innovation and technology. Successfully known in the performance automotive industry as a manufacturer of high performance racing wheel designs, Enkei is also a dignified supplier to numerous Original Equipment Manufacturers (OEMs) across the globe. We were offered the opportunity to tour their production plant in Columbus, Indiana, for a behind-the-scenes look at what goes into the manufacturing process of their wheels. Enkei is well known for producing sophisticated racing wheel designs, such as the RPF1, for the consumer market. Lesser known is that they are heavily involved with a variety of motorsport, including rally, drift, sportscar, and even single-seater racing—including being the Official Wheel Supplier to the McLaren Formula 1 team since 1995. Even lesser known, is that they also supply some of the biggest Japanese automotive manufacturers, like Honda and Nissan (and General Motors in the United States), with their technologically advanced aluminum alloy wheels to be used as original equipment on new cars. Situated about 45 minutes south of Indianapolis, Indiana, this awe-inspiring Enkei manufacturing campus hosts several different buildings, each with their own unique addition to the final product. It also hosts its fair share of wildlife, whether it is a crane circulating the company pond, or—well, you’ll see the rest. With only one foot through the door of the office building, it was clear to see that cleanliness is very high on the priority list at Enkei. Everything floor to ceiling is coated in glossy bright white, and it was all completely spotless. The next thing to notice is how open every space in the office is. The desk allotted to each employee is not cumbersome or fastened anywhere. Quite the contrary in fact, these desks are kept minimal and mobile, as once every six months, the layout of the room is completely changed by the employees. This fluidity in structure is thought to keep the energy from getting stale and prevent clutter. Family is well respected throughout the campus, as employee’s children have framed artwork populating the walls. It’s nice to see that the safety protocol of the workers is important enough that they even have illustrations of proper practices being implemented. In one of the larger office rooms was an array of unique glass tables below an elaborate display of wheels. Now, if the glass of the larger table looks a little interesting with that hole in the center, that’s because it’s actually the lid of a fish tank. Yes, Enkei repurposed a glass meeting table into a large fish tank—one of many tanks located around the grounds. Remember earlier I said Enkei was involved in various motorsport along with their road-going products? Here’s a past example of the pinnacle of their craft, this is a forged lightweight magnesium wheel made by Enkei Japan for the 2003 McLaren MP4-17D Formula 1 car. This wheel not only birthed the innovative split-spoke design of their famous RPF1 road wheel, but also helped Kimi Räikkönen secure second place in the World Championship that year. Concealed behind a glass case were cutaway wheels explaining the assorted steps involved with the production of an Enkei wheel. It was a great display, which was perfect preparation for the upcoming tour inside the factory. Elsewhere in this room were a number of plaques stating the very important core values, principles, and slogan of the Enkei business. More fish tanks brought a certain amount of life and energy to the room, and accompanied the plaques on the wall. Hi, Geoff! Believe it or not, the banners of our very own residential drift expert, Geoff Stoneback, located throughout their buildings weren’t placed on the walls because of our arrival; they’ve been hanging for a while. Solid logo placement on the bottom of this car, right? Emptying out of the offices and into the lab area, we were guided into their quality control and testing rooms. Enkei prides itself on scrutinizing and testing its wheel products on a higher level than current standards demand. The company even founded its own inspection grade named “Spec-E”. Observed by Enkei as being tougher than Japan’s severe JWL requirements, Spec-E testing requires a higher drop point in the impact test and 20% more cycles for the rotary bending fatigue and dynamic radial fatigue tests. Along with the stress testing, Enkei also saturates wheels using corrosive materials and salt spray tests to test if its factory paint finish can stand up to the elements long after production has ended. Also, sections of test wheels are partitioned and heated to extreme temperatures in an oven, while others are sliced and analyzed under microscopes to better understand and test the strength of the aluminum alloy that makes up the wheel’s construction. In order to aid in the discovery of faults, this spray test is used to pinpoint any imperfections on the wheel surface following the numerous stress tests. It was now time to switch buildings, and just to make the transition across campus a little easier, Enkei utilized golf carts and SUVs to travel throughout its acreage. Next stop was inside the plant where wheels for several different automotive manufacturers are actually produced. Due to very sensitive information (like proprietary equipment, or unreleased wheels) located at just about every turn inside this section of the tour, I will have to explain some processes without the use of imagery. Let’s start with the raw material, as it is essentially the birthplace of every wheel. These bricks of Enkei’s formulated aluminum alloy are melted down inside of one of the many gigantic furnaces throughout the floor. I must say it was pretty hot in this section of the building, mostly because these furnaces use extreme heat to start the process of wheel creation. If you’ve ever stepped off an airplane in Arizona, or opened an oven door, then you probably have a vague understanding of what this room felt like—except this was hotter. Not quite like the ending of Terminator 2 hot, but it was hot. Speaking of Terminator 2, picture the shiny liquid state of the villain in that movie, and that’s the consistency the alloy becomes in the next step. I am unable to show you directly due to some classified secrets, but that bubbling hot metal slurry cools to become the shape of a wheel. From there, the fresh wheels are trimmed down to skinny, spare-tire-looking examples of the full wheel they will become, but with excess thick material in the barrel. Enkei then exhibited its process involving lots of heat and special tooling, which expands this material buildup to create each wheel’s inner barrel. The newly expanded wheels were then transferred into another furnace used for hardening. This furnace heats the now-whole wheels up to extremely high temperatures to rearrange the molecules in the alloy, producing a much stronger wheel when it is received out the other side. Taking a pit stop from our tour, we relocated into this office overlooking the production floor to cool off, and what did we find? Not only fish tanks in this room, but also healthy greenery and chirping birds. It’s a testament to the wholesome conditions found throughout Enkei’s buildings, contrary of the unforgiving environments usually associated with manufacturing facilities of this magnitude. The hardened wheels then made their way to this section of equipment dedicated to machining the wheels. Many of the Enkei examples present on road-going vehicles share distinct characteristics like machined faces on their design. Without these large mechanisms, it would be nearly impossible for Enkei to produce such a renowned and desired look. For this reason, I can’t show you the exact process, but the wheels come out looking like the bottom image. Some designs are then treated to a fresh coat of black paint, and then returned to this section for a process Enkei refers to as “Refacing”. This creates the look we’ve all come to enjoy on new production vehicles, exhibiting a machined wheel face, with black painted surroundings. From there, the various work orders of wheels that have completed all of these steps are compiled into their own towers. Enkei uses their own branded organizers to stack as many wheels onto a pallet as possible. It is here that wheels await their treatment process, which makes them one step closer to becoming a finished product. For the same reason a magician doesn’t explain tricks, I can’t physically show you how Enkei applies their black color to the wheel, or display the solution they use to coat the wheels. However, the wheels enter a number of chambers via this assembly line, and exit with their shiny new coat intact and cured. The next process involves a group of different treatment tanks, which the wheels pass through like a gigantic fun house. A maze of different levels and treatments leaves the wheels gleaming, and protected from any number of outside elements they’ll encounter on the road. More lively plants line almost every hallway, even inside the general production floor. The thriving plants are a really nice reminder that conditions are more than favorable inside this facility. The final step of the wheels is the visual inspection. 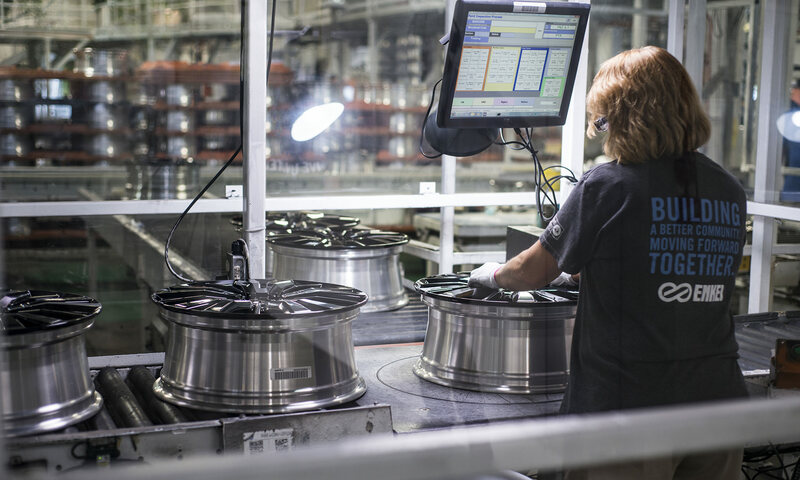 Each and every wheel that passes through this facility has its individual product code scanned into their database, and gets meticulously inspected by a trained employee, so the history of each one is traceable. Leading into this room, there were examples of wheels that were found to have faults. I can’t show them to you because the wheels aren’t released yet, but let me just say, they were some of the most miniscule faults, which were nearly untraceable with the naked eye. The level of scrutiny that Enkei places on its final products is beyond strict. This helps to ensure that every wheel exiting their premises into the real world exudes nothing but complete perfection. Before being palletized for storage and shipment to their chosen destination, the wheels pass through one final robotic scanning station signaling the conclusion of their production. We then walked back through the plant-lined production floor, and into the offices we had toured earlier for our own conclusion of the tour. Once we were outside of the enormous production facility, got our bearings back, and our sense of direction returned, it really sank in how large this campus is. We had only toured one of several buildings found on this campus, all equally large in size, all with different influence on the overall production of Enkei wheels. We careened through the winding road leading to the exit of their business park feeling a much greater sense of confidence in the quality of Enkei wheels. While their aftermarket and racing wheels are produced in the company’s homeland of Japan, it goes without saying the same strict principles of product quality and healthy employee atmosphere carry over between all of the company’s facilities across the globe.